Yesterday was a beautiful day at Royal Docks. An area in East London that until 1981 was the largest enclosed dock area in the world covering 250 acres of water and 1100 acres in total. Now it is new housing. Excel, a large exhibition centre can be seen in the top left of the picture. Thursday this will be the venue for the G20 summit. The closest stops on the DLR (Dockland Light Rail) will be closed to the public. As will the footbridge to the Excel centre and the Connaught bridge to traffic. Late in the afternoon I saw several police buses, bikes and vans. I assume a test run. Or maybe just familiarising themselves with the route. Even the swans are ordered out of the area. I imagine the protesters will become more vigilant. That's fascinating! The swan and her ducklings make this picture, perfect! My blog: http://go-joke-time.blogspot.com ! Join Us! It looks so peaceful at the moment! It's amazing how those ducks can live peacefully at such an industrial area ... Beautiful photo, Mo. Oh, and thanks for the link. I'm linking yours back. We've heard a lot about G20...it is nice to have some idea where it will be held. Thanks for a very fine photo. 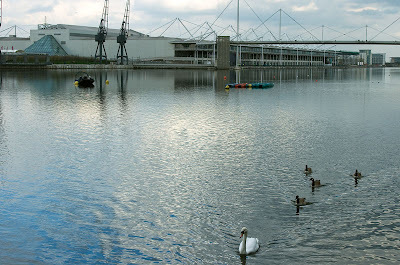 When I looked at the picture, I just noticed the swans in the Lake ^^"
Oh, It's very beautiful and fresh in London. Once again I say ^^"
Life in London sounds even more exciting than usual this week. Soak it all in for us. Follow the leaders. Nice photo. It sort of reminds me of sheep. All following the leader. Nice photography too. I've been seeing the last photos you posted and it seems to me a great visual liveliness. Congratulations on your way to capture London. I saw a swan at Lake Toho today - first time ever. As for getting on my site, I have no clue what the problem could be, as this is the first time anyone has mentioned any difficulty in accessing the blog. Thanks for letting me know, I'll try to see if there is something I've done that is causing the problem. YES! Like others before me, I was attracted by the white swan and her ducklings. I'd rather follow her as a leader ... She's so much more beautiful than the other ... 20! Thanks for your beautiful glimpses of London! I wondered where the G20 was being held in London and now I know! Those ducks and that swan better watch out. the police might arrest them under the Terrorism Act for swimming with intent! Prekrasne slike i blog, kroz njega sam upoznala London iako nisam bila u njemu. It used to be vagabonds, vermin and filth, and look at it now! Those cygnets look remarkably like ducks. Wonderful capture and nice to see exactly where Gordon Brown actually plans to lead the world through the difficult times. Hoping the summit ends up doing something substantial... Fast!